Blizzard has gone back on their controversial plan to keep flying out of World of Warcraft’s newest area, Draenor. Kinda. 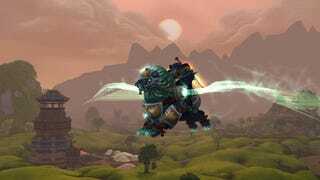 First, the good news: eventually, you’ll be able to use flying mounts in Draenor. You’ll be able to spread your wings and fly on a dragon or a robot or a different dragon or a different robot. Also, monsters. There’s no exact date, but it’s coming in “the near future.” Originally Blizzard was planning to keep players’ wings clipped permanently, as they felt that flying mounts discouraged people from exploring and enjoying the game’s lovingly crafted war worlds. I’m sure there’ll be some pushback, but it’s a pretty excellent compromise between Blizzard’s goals for WoW and what players demanded. It’s pretty much a perfect solution, if you ask me. Maybe you won’t agree, but I like wandering around, seeing the (oftentimes spectacularly imaginative) sights. I’m glad WoW eventually lets me become a gravity-defying demigod, but it’s fun to feel like an ant on the back of a giant for a while too. What do you think, though? Are you happy that Blizzard’s bringing back flying? Do you think earning it through exploration is a solid solution to the problems flying presents? And lastly, are you at all worried about what’ll happen after everybody’s unlocked the option to fly (decreased world PVP, etc)?